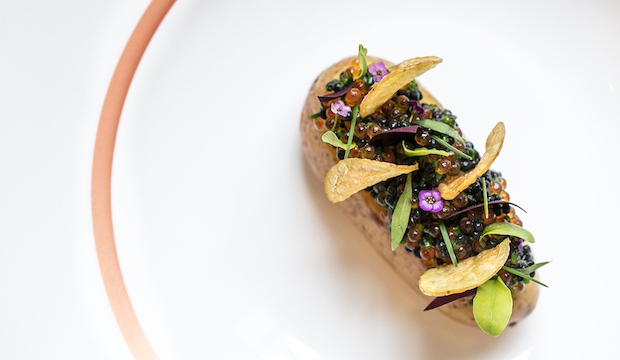 Clare Smyth has made culinary history. She is the first British female chef ever to earn two Michelin stars in her own solo restaurant and, what's more, be awarded two stars straight off – an extraordinary feat by Michelin standards anywhere in the world. Her exceptional talent was long recognised by her former boss Gordon Ramsay; she was chef-patron at Gordon Ramsay Royal Hospital Road for eleven years. Most appropriately, Clare received her stars from Gordon Ramsay at this year's glittering Michelin awards held at the IMAX cinema with an audience of 400 chefs and obsessive restaurant watchers. 'Smyth is, undoubtedly, one of the greatest chefs to have graced my kitchen,' confirms Ramsay whom we understand is a key investor in Core by Clare Smyth. 'I don't know how it is to cook any differently, I just cook as myself,' is always Smyth's reply when asked how it is to be a female chef at the top of her profession. Though she does hope her accolade will empower other women to believe they can achieve Michelin stars, still very much a boys club. Only one other female chef, Nieves Barracan of Sabor, received a new Michelin star in the Michelin 2019 guide. Clare is pleased too that more young female chefs are applying to do stages at Core by Clare Smyth. No doubt, she will now be inundated. Located in Notting Hill's Kensington Park Road, the 54-seat restaurant showcases British ingredients and supports artisan producers. Clare draws too on her childhood spent on a farm in Antrim, Northern Ireland. The restaurant is calm, elegant yet unstuffy, strictly no tablecloths, and service is notably relaxed and friendly, For the ultimate experience, book far far ahead for the chef's table dining experience. The ten-seat table (which is sometimes split to accommodate smaller groups) is positioned directly in front of the kitchen, so diners are completely part of the action and atmosphere of the most compelling kitchen in town.